AutoCAD is a CAD (Computer Aided Design) software application for 2D and 3D design and drafting, developed by Autodesk. Converting DWG to PDF is a practical way to share your drawings with other people, without them needing to install AutoCAD. 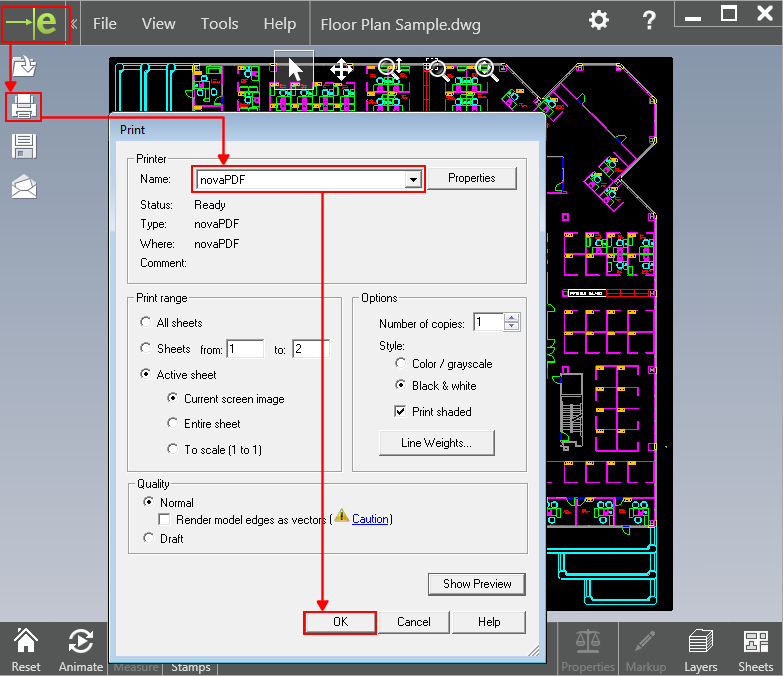 By having novaPDF installed you can easily convert DWG to PDF documents by pressing the Plot/Print button and choosing novaPDF as the printer. PDF watermarks. You can add automatically a text/image watermark (copyright notice, logo, …) to your converted drawing. PDF security. If your drawing contains sensitive information, novaPDF lets you convert the DWG file to a password protected pdf. This way only recipients that know the password can view its content. PDF merge. You can convert your drawing to a PDF, and after that you can merge the PDF with other documents (for instance if you need to add a price quote from a Word document, you can print the Word document via novaPDF to the PDF that contains your drawing – they will be automatically merged). 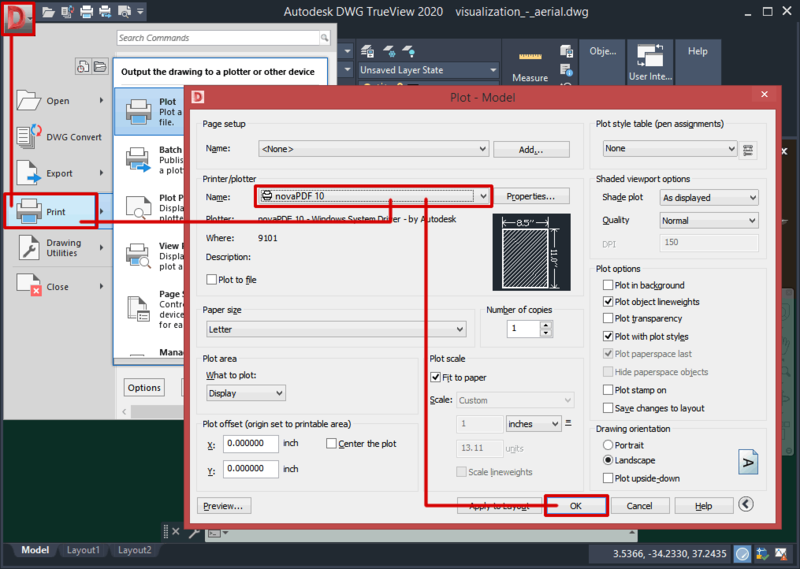 DWG TrueView is a free application from Autodesk which allows users to view and plot AutoCAD DWG and DXF files, and to publish these same files to the DWF file format. In DWG TrueView click on the TrueView logo then Open. Browse for the DWG file you want to convert to PDF and click Open. Click on OK and choose a location to save the PDF file. eDrawings is a free software from SolidWorks, allowing users to view and print DWG, DXF aside the proprietary SolidWorks files. 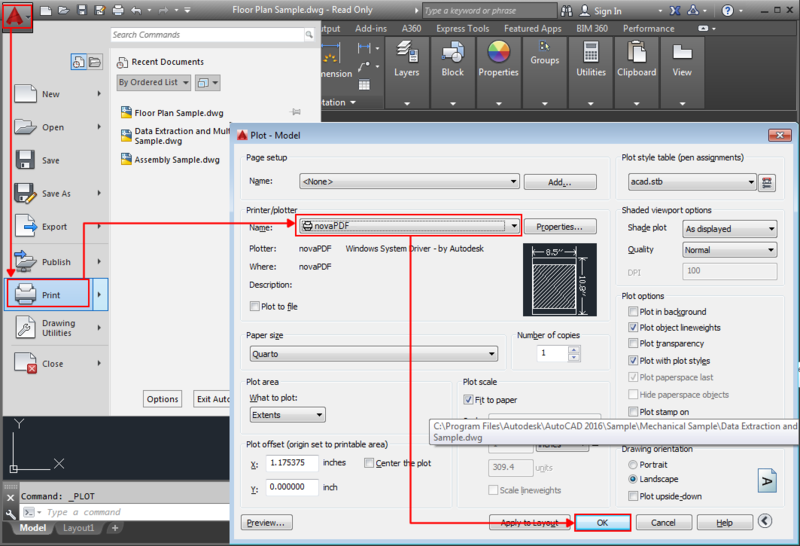 If needed, adjust novaPDF's settings using the Properties button and set custom printing options. This tutorial shows how to convert DWG files to PDF documents using novaPDF with AutoCAD, Autodesk TrueView, SolidWorks eDrawings and Volo View. If you have suggestions on how to improve this article add a comment or rate it. This tutorial will show you how to convert a .DXF file format which is a universal format developed by Autodesk for increased compatibility with other programs running vector image files, to a PDF document by using the novaPDF printer driver. If you do not have novaPDF installed, use the Download page to download and install it.